Mud Outlaws Hammer the Pit. There is just something about Mud that Robs Horsepower. It always seems as though you need a little more horsepower to get through the goo. Well we found some trucks that run down in Louisiana at Mud Truck Madness that have enough ponies to overcome the thickest muck. We call them Mud Outlaws. These Trucks are setup just like the Dirt Drag Racing Trucks with Big Boggers on the Back and smaller tires on the front. They are Four Wheel Drive but the front end doesn’t look it does a whole lot. They run through the mud pit that is as much as 2 feet deep or more in places. Its a 100 feet of wide open pass going off the Tree. These trucks pull down in the mud at the beginning of the course. When the light goes green they go Wide Open Throttle. They make enough power with massive Nitrous Injected Big Blocks that they quickly get on top of the mud and basically hydroplane their way out the end of the track. It is a little sketchier than the dirt dragsters because the mud is more unpredictable. Some of the trucks wind up on their sides or even on their lids. The crowd loves every minute of it as they get splashed with mud during each Full Throttle Pass. They even let the Mega Trucks make a pass. If Mud Ain’t Flying You Ain’t Trying! Check out the Busted Knuckle Video Youtube Channel for more Mud Outlaws Action! 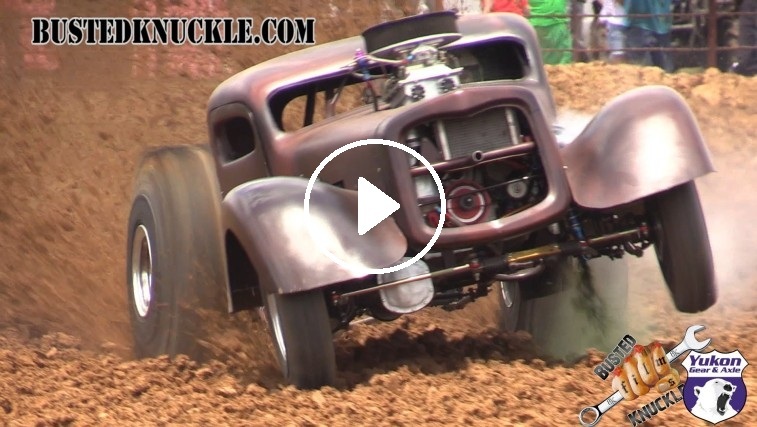 Watch This Dirt Drag Truck ride the back tires all the way down the track.